Smudging is, by now, a ritual that is widely practiced in the Pagan community. 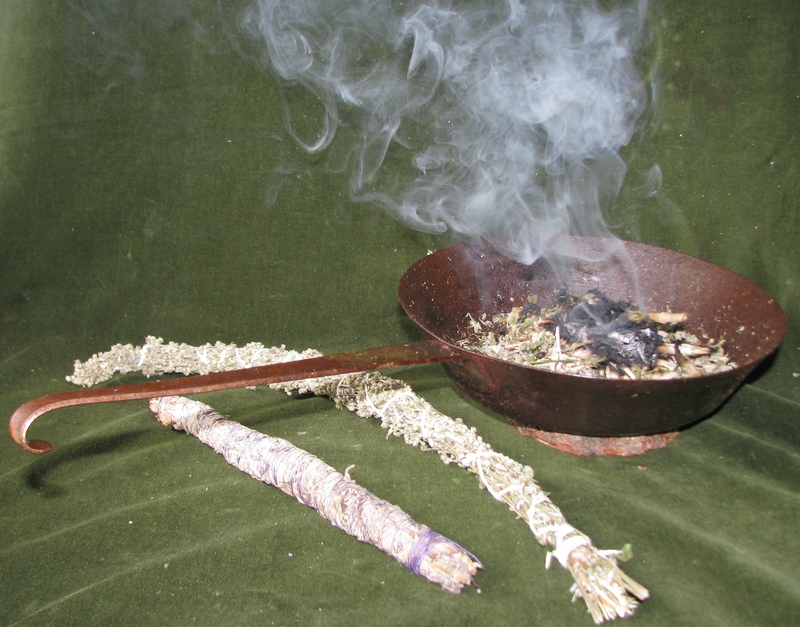 What I mostly observe when invited to pagan group ceremonies, though, is the use of Prairie Sage bundled into smudge sticks, a way of smudging as we see some Native Americans doing it. Sage smudge sticks are a great tool in many ways (easy to carry around with you, easy to light, to hold in your hand etc. etc.) and considering which plant is being used and what it is associated with, it makes so much sense. But as always in my spiritual practice, I ask myself: is there something my ancestors did, or folks still do, that is more connected to me and my own homeland? So, what I would like to do today is explore a different smudging practice. Please see that as my personal approach, and really as a nudge for you to look around yourself, geographically as much as in terms of tribal ancestry, and, who knows, perhaps you’ll find a personal way of smudging, too. Then, we simply spread the dried herbs or the resin incense over the glowing amber. W walk with the fumigating pan through the rooms, or fan the smoke over the bodies of people in need of a cleansing, may that be for a ritual or a healing. The beauty of the Räucher-Pfanndl is that you are not limited to one herb like with the smudge stick, but can put together the right mixture for the purpose at hand. One of the most often used herbs is mugwort, or Artemisia vulgaris. This is a plant you can find pretty much anywhere, and it has been used for tens of thousands of years, as Neandertha grave sites have been found where the dead were placed on a bed of mugwort. The plant itself is actually related to prairie sage, which is also one of the hundreds of Artemisia species. While the syllable mug is rooted in the German (Saxon) word for power (in today’s German Macht,) the Latin term indicates the plant’s relation to the Goddess, Artemisia. Mugwort is usually collected at the Summer Solstice, and then used for smudging after the Winter Solstice, during the Rauhnächte (smoke nights) thereafter until January 6th. During the Frauendreißigt (see more about that time period in August/September here) Alpine folk bundle seven or nine herbs into a Kräuterbuschen (an herb bunch,) have it consecrated, and then hang it to dry. The herbs, particularly mugwort and St. John’s wort, hung under the roof, are said to protect home and hearth from lightning. For healing smudging, any herb that would be used as tea, a tincture, or ointment, can also be sprinkled over the ambers in the Räucher-Pfanndl to cleanse the aura and the environment for the person needing the healing. Using Juniper needles is a good way to disinfect a room where someone lays who’s sick, and the smoke of Juniper berries give the ailing person comforting dreams. Because of its healing properties we call Juniper Wacholder in German, with holder being rooted in the same Indo-European word where holy comes from. In the cold season, as we experience it right now in the northern hemisphere, fumigating resin from trees like spruce and pine help against coughs, and smudging with lichen helps against a running nose. Both resin and lichen should be collected during the dog days, because due to the extensive heat , the resin contains less water during that time. As you can see, there is quite a body of knowledge and detail behind smudging in the Alps, knowledge that I could imagine to be interesting to other cultures, too. And I wouldn’t be surprised if you found something similar in your land and from your ancestors. This entry was posted in Uncategorized and tagged alpen, alps, austria, brauchtum, celtic, celts, ceremony, customs, druid, druiden, druidry, Earth, folklore, goddess, heiden, ritual, spiritual. Bookmark the permalink. I really enjoyed this post! Thank you for the inspiring information. 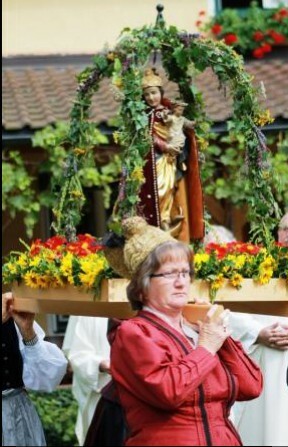 I live in Germany, actually, so it is nice to learn of spiritual traditions that date back to a prechristian time. And since smudging sage is hard to get here, and wicked expensive to boot, this has given me some ideas for other ways to cleanse the air. I fell in love with sage because of it’s almost magical ability to deodorize the house. Once, my dog got skunked, and my husband not realizing until too late opened the door and let her inside. The smell was everywhere, and with no better ideas I lit a sage smudge while my hubby washed the dog. Within a short time, the skunk smell was GONE! Seriously impressed! Well, maybe I’ll find some new herbs to enjoy burning in my beloved cast iron pan! Thanks for writing, Christian! I’m sharing a link to this in an upcoming Druid Garden post :). I love this approach!